We could not be more pleased with the incredible turnout from last Friday’s 20th Anniversary celebration, not to mention the outstanding collection of artwork from this invitational. All it takes is one look at the variety and quality of the artwork currently covering the walls, and it’s clear why these amazing artists (not to mention the collectors who purchase their work!) have led to twenty successful years at Principle Gallery. Here’s to twenty more! Feel free to check out our website or stop by the gallery in the next few weeks to check out the 20th Anniversary Invitational for yourself! Switching gears, we thought it might be nice to use the blog as a place to highlight some of the artists who will be featured in May’s exhibition, entitled “Tourist Season”. Inspired by the influx of visitors to the greater DC area during this time of year, Principle Gallery will also be celebrating visitors, in the form of a stellar group of artists whose work has never been shown at our gallery before! Each blog post leading up to the May 16th opening reception of the show will feature some brief information about a couple of the artists whose work will be included in May’s “Tourist Season” show. Today, we’re highlighting Marina Dieul and Mark English. Hailing originally from France, Marina has been painting since childhood. 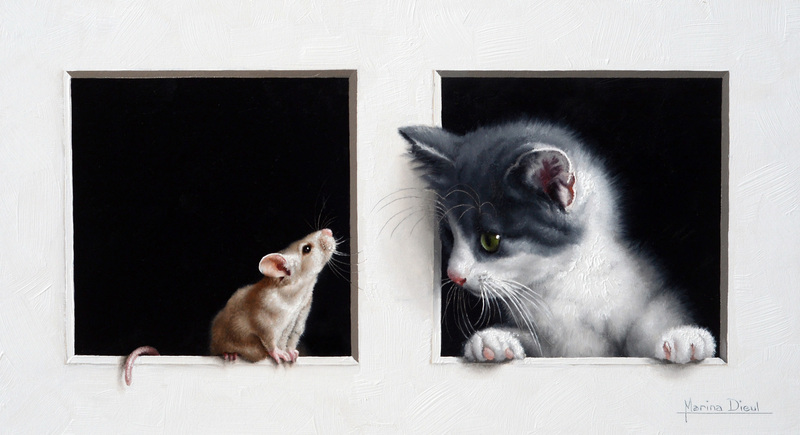 Eventually moving to Canada, where she currently resides, Marina has become a well known and highly regarded name in the art world, best known today for her evocative portraits and heart-melting depictions of small animals. Marina has been named a Living Master by the Art Renewal Center, and has accumulated an impressive number of honors and accolades– last year alone, she received awards including First Place in The Artist Magazine Competition, All Media category, Award of Exceptional Merit and Best Portfolio Award at the National Portrait Society of America’s International Competition, and Second Place in the People and Figure Competition for International Artist Magazine…just to name a few. Born in Texas, self-taught painter Mark English has had an impressive journey as an artist. Originally a painter of signs for small-town businesses, Mark has developed outstanding notoriety in the art world since his graduation from the Art Center College in Los Angeles in 1960. Now both a renowned illustrator and successful painter for galleries worldwide, Mark has been elected to the Illustrators Hall of Fame in New York and can count his work among numerous prestigious private collections around the globe. His unique style in both painting and illustration has garnered him literally hundreds of awards and the status of the most awarded illustrator in the history of the Society of Illustrators in New York. 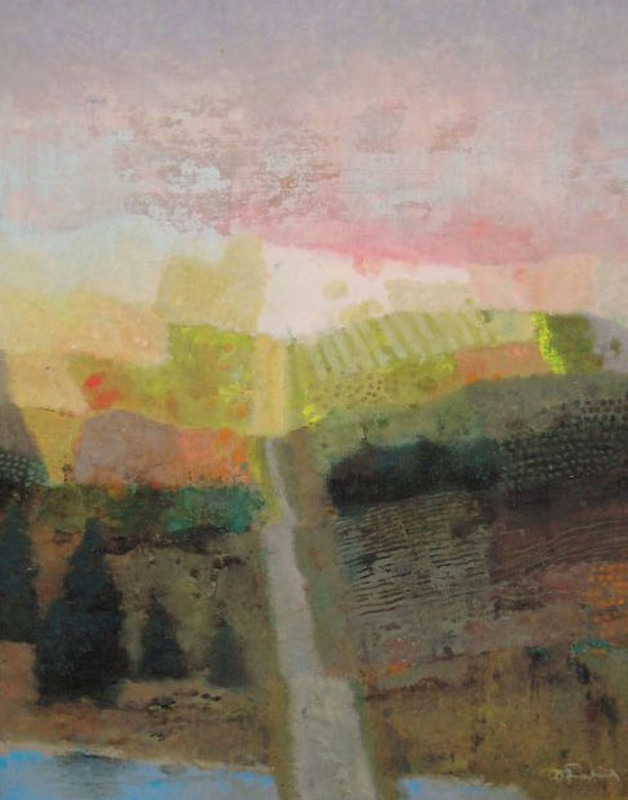 His paintings, typically mixed media portraits and landscapes, feature vibrant color and mesmerizing luminosity. Continue to check in with the blog and follow our social media pages on Facebook, Twitter, Instagram, and Pinterest for more information and images about the upcoming show!